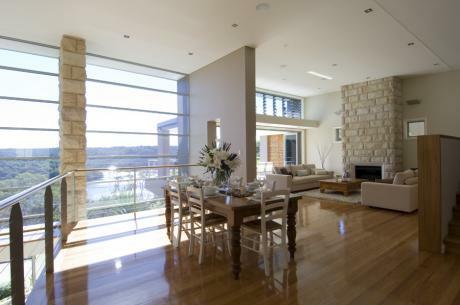 This new home was constructed on a north facing site with stunning views of Middle Harbour. The original 1957 home had difficulties with access, the floorplan was not functional and the finishes outdated.The design brief was therefore focused around solving these issues.The result was an open plan home with a strong contemporary feel with lots of light and space. Finishes centre around a neutral palette with sandstone featuring inside and out. The specification and resulting design detail have created a fabulous living space.